keep knocking into doors, ledges, walls, basically anything of hard surface for no strange reason these couple of days. 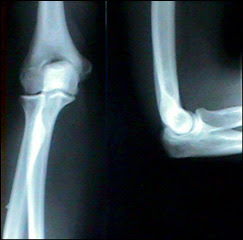 anything that was of a joint and solidified porous calcium just did, from the elbow, to the knee, even the hip bone. it hurt, yet did not. there is now better comprehension as to why wall punching can become an occurrence under inebriated circumstances. the substitution of one pain for another, one that was, perhaps, easier to bear and feel. did not deliberately start a duel with the hard surfaces around, just happened to keep ramming into something on an accidental basis, and no, not on anything of any sort of alcoholic content or crack. accident prone just took a whole new level with this clumsy bones business. reckon my nerves are probably a little more frazzled than usual, either that, or completely fizzed out with this out of sort, out of body offness. really, there is no pain. Welcome to my world, my fellow klutz.